First off, the Steelers-Seahawks Super Bowl this weekend is a dream matchup for me (and several of my Pennsylvanian coworkers). I have generations of Steeler fans in my blood, but I'd also be happy for Seattle fans if the 'Hawks won. It's always cool to be in a championship city. Seattle is like a Selesnya city—lush and loving and full of converts. As for Pittsburgh, it's a Gruul town all the way. Seattle drinks a latte, whereas Pittsburgh knocks back a shot of whiskey and then punches you in the grill for looking at its girlfriend. I'm much more of a Selesnya guy these days, but hey, this is Gruul Week after all. That should mean good things for the Steelers. The Gruul cards came in from design with one goal—bash opponents to death with an array of ever-larger brutes. While it was a refreshing change—the beatdown in Ravnica was a combination of Boros's tiny speed and Selesnya's steady growth—it lacked the robustness of the other guilds. Generally we tried to give deckbuilders different routes to take within each guild. Dimir, for example, could try to be a milling deck, a tempo aggro deck, or—assuming it incorporated lots of cards from previous sets—a control deck. Similarly, Orzhov can go the beatdown route, the aggro-control route, the slow bleeder route, or maybe even something else, like reanimator. We want our cards and themes to hint at potential decks, not blatantly spell them out. But Gruul… Gruul wanted to do one thing, and it wanted to do it very well—attack with fatties. It is quite ironic that the least structured of the seven guilds released so far is also the most focused. Other themes were tried, including one based on land destruction. 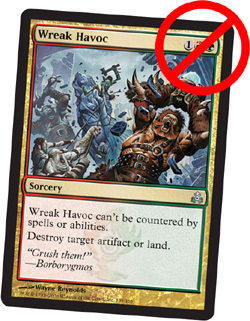 Wreak Havoc (famously) was three mana during varying stages in development, but the long shadow of Stone Rain kept it from being printed like that. Two three-mana LD spells—especially two that can easily fit in decks packing eight total Birds and Elves—put enormous deckbuilding constraints on everything else in the format. * Having your first two lands destroyed and facing down a Rumbling Slum before you could even play your Sakura-Tribe Elder is not something anyone should want to experience regularly. We gave it an honest shot, we really did, but in the end we had to settle for a reasonable card as opposed to a jaw-dropping one. And so went the potential land destruction theme for Gruul. Beatdown, as a major theme, needs a lot of cards to work right. Ideally, you want to give deckbuilders several choices at each mana cost so that several different decks could potentially arise. Look at Gruul's rare four-drops, for instance. Rumbling Slum is the de facto starting point, but Ulasht, the Hate Seed and Giant Solifuge each bring something else to the table. The latter is golden against control decks with few or no creatures; the former shines in creature-filled mirror matches where the board starts to fill up. Because we wanted these options to exist, we had to fill up a lot of Gruul's slots with creatures. That need for creatures is part of the reason why there is no Gruul “burn spell” (other than Savage Twister). On top of our need for creatures, we had no great design for a burn spell that felt Green, plus we had to deal with the redundancy issue of the guild already having access to Shock, Volcanic Hammer, and Char. Those felt like plenty, and adding more would potentially shift the focus from the guild from beatdown to burn. Bloodthirst, as you see it, appears only on creature cards. Was that always the case? No. Bloodthirst could have appeared in a more kicker-esque form on instants and sorceries, and did so for a while in design. But the nifty yin and yang of Izzet caring so much about spells and Gruul being concerned solely with creatures was too good to pass up. Bloodthirst was a tough mechanic to balance. Each card needs two “modes” that cost the same amount of mana to play. The baseline bloodthirst card looks something like Gristleback—a hair below the curve without bloodthirst, a hair above it with. But tightly constrained cards do not a fun mechanic make—if the card is always close to fair, the bloodthirst ability loses most of its relevance—so we decided to up the “swinginess” on quite a few of them. Ghor-Clan Savage is a real stinker if you don't connect pre-summoning, but a giant beast if you do. Similarly, Scab-Clan Mauler is better than Watchwolf if blood has been spilled, but worse than Defiant Elf if it hasn't. Because the payoff is so high on those cards, we liked that bloodthirst could be looked at as a fun build-around mechanic as well as a potential tournament contributor. On the build-around note, one subset of bloodthirst cards that I'm particularly happy with are the ones that have abilities based on their power—Rabble-Rouser, Skarrgan Skybreaker, Battering Wurm, Skarrgan Pit-Skulk and the aforementioned Gristleback. Not only do their abilities mesh seamlessly with the bloodthirst mechanic, they also have a form of unbounded potential that can lead to some crazy game situations. Just toss some Sunforgers into a deck with some of those cards and see what ensues. As I discussed earlier, we wanted to potentially enable several different kinds of Gruul beatdown decks. Kird Ape in Ninth Edition helps enable the quickest versions. The reprinting of Savage Twister could potentially allow a deck based strictly on huge beaters to compete. But one question bugged us incessantly during development. How could we enable a beatdown deck in Standard that would not want to play that darned Umezawa's Jitte? We had a card in the file that was the precursor to the printed version of Burning-Tree Shaman, only more absurd. It was a 3/4 for 1RG with the text, “Whenever an opponent plays an activated ability that isn't a mana ability, CARDNAME deals 1 damage to that player.” Ha ha. A tad bit ambitious, no? I can't exactly recall what made us believe that a creature that efficient and that mean could also be that one-sided, but it had to be some underlying frustration with the Jitte and its older cousin Sensei's Divining Top. The problem was that that version of the Shaman didn't particularly mind how many Jittes and Tops were in its controller's deck. So in an attempt to reduce the card's power level, we made it symmetrical, and with that move we may have actually created a good enough reason to build a tournament-caliber Standard deck full of creatures, bent on attacking… that doesn't benefit much from Umezawa's Jitte. Maybe. Maybe we're just dreamers. As I did in my four previous articles on the Ravnica guilds, here are some fun Multiverse comments from the development of the Gruul cards. Gruul Guildmage at one time had mirrored abilities akin to Earthquake and Hurricane. While it was an elegant pair of abilities for Red/Green, it didn't fit the Guild's style of play. MR (12/21/04): This seems like a nice mirror, but it doesn't feel like it fits into the larger picture. AF 1/6: A nice duality, but does this play into the "guild theme?" The four from CON really define their guilds. AF 4/18: If RG needs more creature removal for constructed, this guy could hit creatures. Savage Twister was one of the defining cards in Mirage Limited, and we had several debates about the benefits and costs of bringing it back as an uncommon. MR (11/17/04): Do we really want this in uncommon for limited? I know it was very frustrating in Mirage. bs 12/2: it should come up at lower frequency here. MT 12/15: Why would the frequency be lower? It was uncommon before and this set is smaller. HS 12/16 Whene Mirage came out, you got 5 X mirage, here you will get 3X Control +2X Alt, so it will come up lower. That said, this is a nice repeat that is "on theme" for R/G, but is it too close to the XRRWW Radiant card in Control? AF 1/6: We should try to have a couple old school gold reprints. If not this, then something else. MP 4/2: I like this card being here. ps 4/6: uncommon wrath seems frustrating in limited. bs 4/25: this card is powerful in block cons. DAL 12/4: I would like to find a place for "Paincast X (If an opponent has taken X damage this turn, this creature comes into play with X +1/+1 counters.) This is the place. AF 12/20: This guy is as random as they get. AF 1/6: Paincast X makes him less random. BD 4/13: I think many players won't know whether they can counterspell this or not. ps 4/19: i'd say many players would assume you can't. Del 4/25: Could just add "CARDNAME can't be countered” to this guy to avoid the question (and make it clear that protection from instants isn't enough). NH 5/9: Very exciting to timmy. Del 5/25: Okay that this counts all damage, not just damage from sources you control? AF 6/2: I don't like that... feels like it wants to be damage I dealt, not every/anyone. Del 6/3: Note that bloodthirst has changed and this card is now consistent with the mechanic. Del 6/16: Bloodthirst X is getting rules support. And the citizens of Sniddler's Gulch lived happily ever, because they really weren't very smart. Which existing guild is your favorite? *: The last time we had a second good three-mana LD spell was Molten Rain in Mirrodin. It, Stone Rain, and Chrome Mox formed the backbone of a tier-one deck. Before that, Pillage was reprinted in Sixth Edition, and quickly found itself alongside its pal Stone Rain in the finals of the World Championships. Precedent, combined with our own in-house data, demanded caution.